Finding the best nursing shoes for men can be tricky. 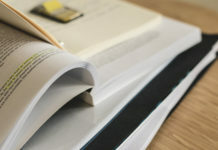 While men’s and women’s nursing shoes are somewhat similar, they still have differences that can affect your comfort, protection, and the support you get from them. This is one good reason to be extra picky with the shoes you buy. Aside from moisture-absorbing linings, the unique sidewall ventilation of these shoes helps in preventing moisture build-up inside. The upper part of the shoes is made from synthetic leather while the outsole is made from injection molded rubber. The insole is made from MOZO’s Tripe Fit System that aids in shoe ventilation. The outsole is made to be slip-resistant with Spider Traction Max. Pros: Comfortable, consistent color, lightweight. Cons: Stitches can wear off easily, not waterproof. 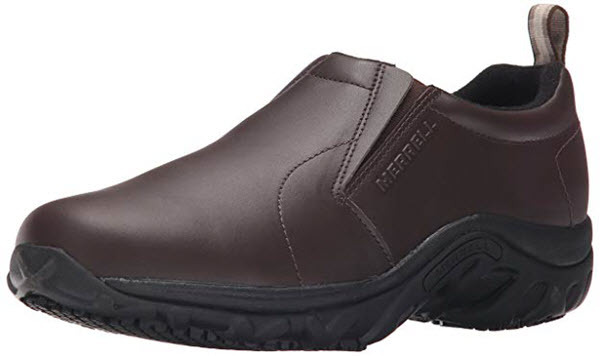 Made from full grain leather, Merrell Men’s Jungle Moc Slip-Resistant Work Shoe is easy to clean and fully waterproof. The insole of the shoes is cushioned and the unique air cushion in the midsole provides stability even in rigorous walking. The outsole is made from Sure Grip® rubber that is slip-resistant and non-marking. Pros: Cushions feet well, waterproof, slip-resistant, unique non-marking outsoles. Cons: Some buyers complained of inconsistent sizes. 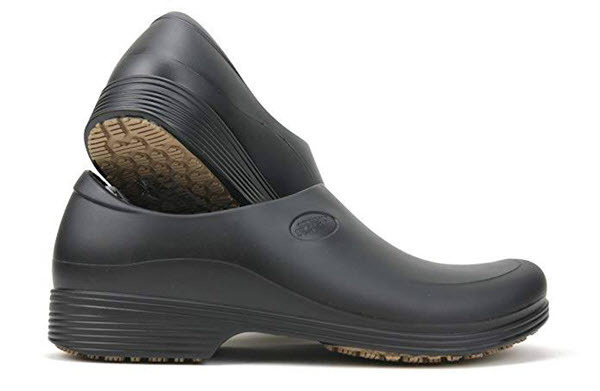 This clog from Keen is easy to wear for everyday work in the hospital because of the simplicity of its design. The outer part of the shoes is made from leather while the outsoles are made from non-marking rubber. The footbed has a removable memory foam insole which is very comfortable to wear. You can easily wear these shoes if you are always on the go since the neck of the shoes is wide enough for a quick slip-off. 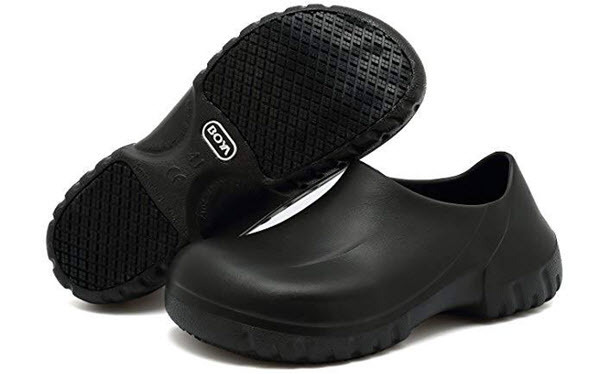 Pros: Easy to wear, lightweight, non-marking rubber outsole, memory foam footbed. 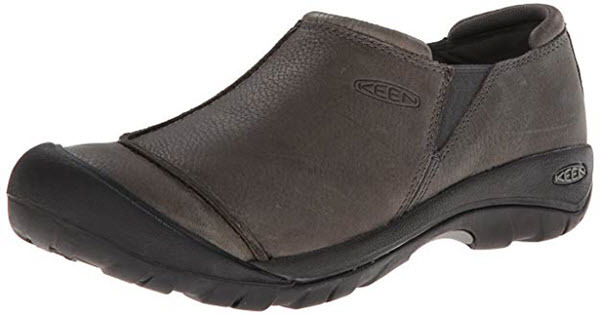 KEEN Men’s Austin Slip-On Shoe has breathable insoles and waterproof exterior. It’s super easy to clean and really quick to dry. 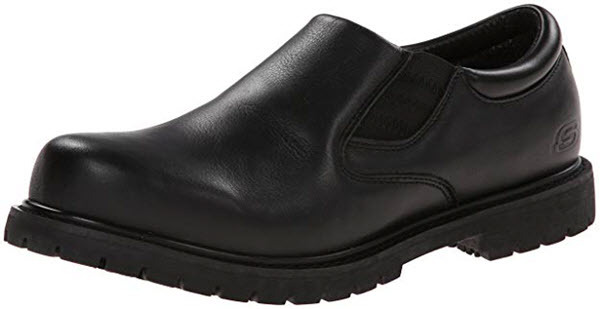 These features make the shoes an excellent choice for nurses who don’t have that much time to clean their shoes before heading off to work. In terms of design, it’s not the most stylish. 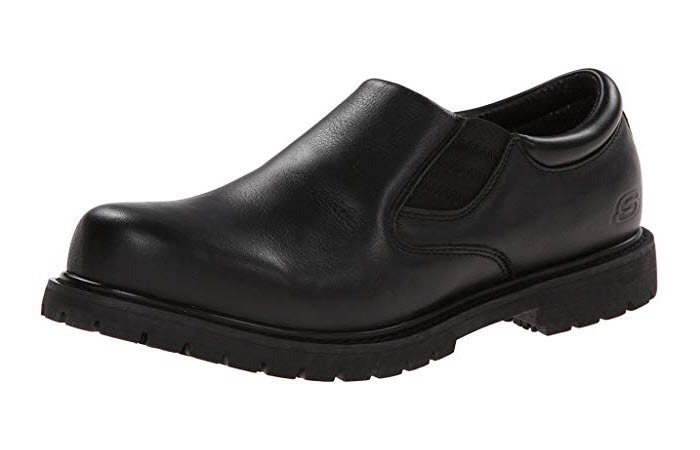 However, when it comes to comfort, these shoes are really reliable, particularly if you are working long hours. It’s nicely made, too. StickyPRO Medical Shoes made it to this list because it’s comfortable, lightweight, waterproof and heavy duty. It’s designed to protect you from falls when you’re working on slippery floors. It can also keep your feet dry throughout your shift. Additionally, the shoes are also resistant to soap, grease, and oil. 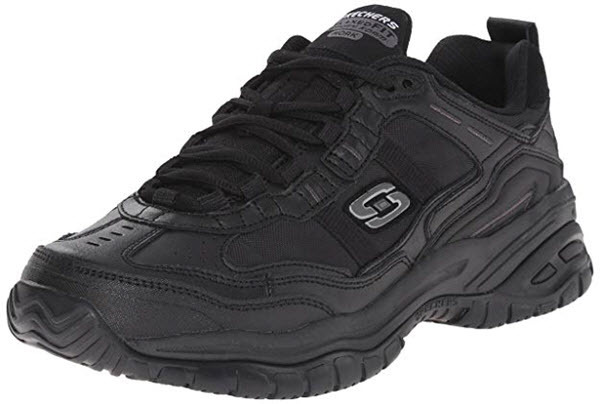 Skechers for Work Men’s Cottonwood Goddard Twin Gore comes with a memory foam cushioned insole for your comfort. And for your safety, you’ll love that these shoes have actually been tested to work well on wet and oily surfaces. It even has an Electric Hazard Safe design. One of the things you might not like about the product is its weight. The shoes are a bit heavy but not to the point that they’ll make your feet uncomfortable. 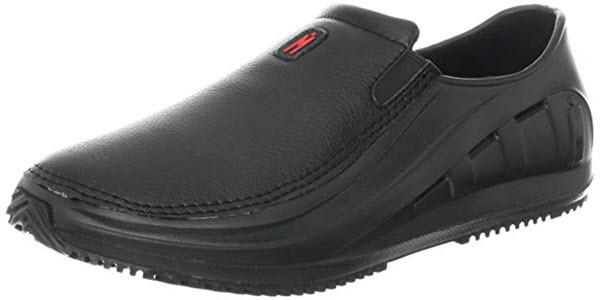 Skechers for Work Men’s Soft Stride Mavin is another excellent choice for nurses. The rugged work shoes have a flexible rubber slip-resistant outsole and a foam cushioned insole. And like the previous product, it’s also EH rated. 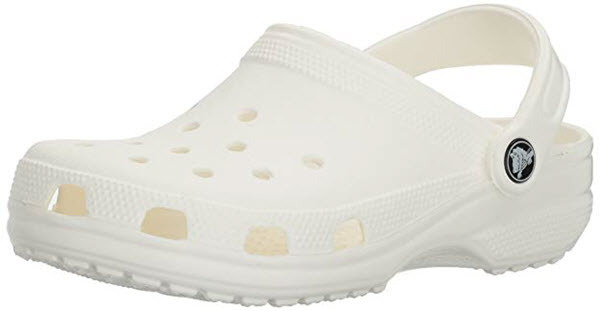 Crocs Men’s Classic Clog comes in different colors. You’ll surely have fun picking the right one for you. Apart from the amazing color choices, these shoes are really comfortable and functional. They may not be the most stylish pair you can own but they aren’t that hard to pull off with any scrubs. The shoes may require a short break-in period to actually mold to your feet. After the break-in, you’ll find the shoes easy to put on and wear. They are lightweight, too. 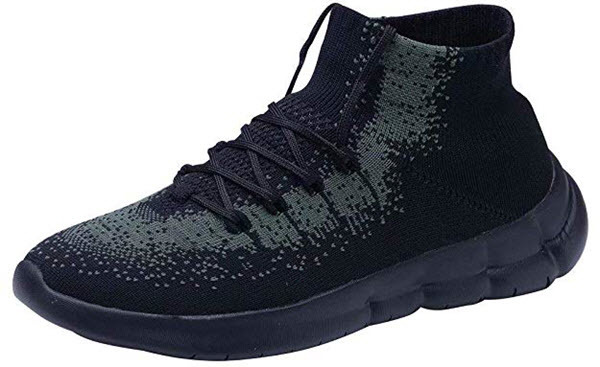 If you tend to have sweaty feet, KONHILL Men’s Lightweight Walking Shoes have a breathable knitted mesh vamp you’ll love. 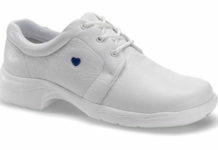 They are ultra lightweight and very comfortable to wear, making them ideal for people who are always on their feet. It’s also quite durable. For its price, you’ll surely find the shoes worth your money. 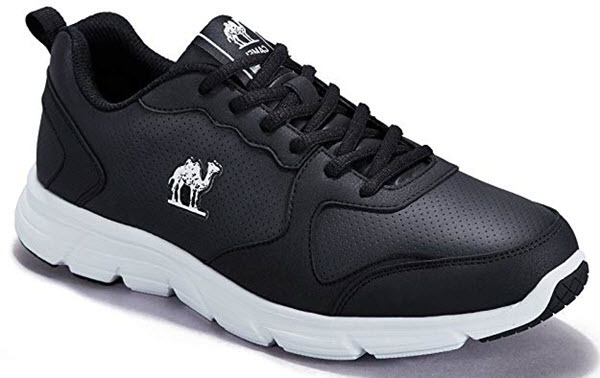 Camel Mens Sneakers Running Shoes can give you that ultimate barefoot feeling- that’s thanks to its ergonomic and breathable design. The shoes feature a cushioning sole which can basically protect your soles when you’re running around. 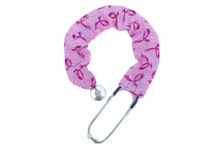 It also provides optimal ankle support so you won’t easily lose your balance. 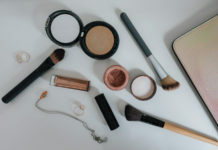 In choosing the best shoes for nurses, you should know that compared to female counterpart, male nurses have different needs. 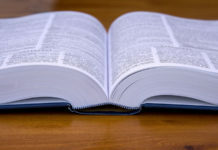 The insoles of their shoes are wider and the outsoles are made extra tough as men have more body weight. These factors should be considered when buying shoes for clinical work so you can be assured that your footwear will last long.